According to Environment Protection Agency recycling, for each ton of paper produced, you need to use 17 trees and 7,000 gallons of water. In addition to saving raw materials, recycling also saves energy, reduces the usage of land, minimizes air pollution and more. You and your family can also participate in recycling. Know What You Need to Recycle! In every location, there are different rules on how recyclables should be sorted and packaged. However, most places tend to accept aluminum, metal food cans, plastic, and glass. Prior to recycling, you should ask your local waste management team to explain to you what you can recycle, how you need to sort and package the items and when they collect the recycling. You should also inquire about where you should dispose of batteries, bulbs and other dangerous items that should not be included in the trash. Plastic can be difficult to recycle since some types break easily. You should use the number printed at the bottom of plastics to know if it can be recycled. The number can also assist you to shop for plastic products that can easily be recycled. 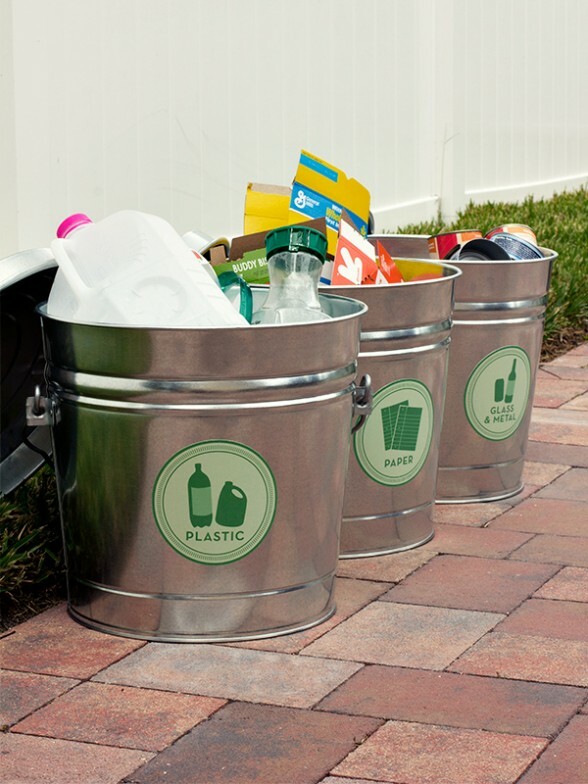 • Convenient Trash Bins: Your recycling program can become unsuccessful if you don’t have an easy access to your trash bin. The pullout container can greatly be of help especially if you position it right at your kitchen. • Baskets with Tags: It’s only right that your kids should also access the recycling system. That is why sliding baskets can be a great idea for you. Remember to tag them according to the content that they will hold. In addition, you can slide the baskets out of view when they are not in use. • Vertical Cans: If you want to economize on your sorting and storage space, you should consider the vertical bins. You can have as many as 6 bins since you just need to hook the containers vertically against the wall. • Stylish Trash Containers: Your recycling project doesn’t have to be plain and boring. You can make it interesting by painting your trash cans. This can be a great way to bring on board the reluctant family members. • Printable Stickers: Is painting your trash cans a little too much for you? You can opt for printable stickers that you can place on basic trash bins. In a matter of seconds and you have everything in place! • The Battery Station: A great mistake that you should avoid is mixing your batteries and bulbs in the same trash can as the rest of the items. Instead, use old coffee containers that can act as a great recycling spot for your batteries. • Wooden Sorting Center: When your family is large, you need a functional recycling center that will perfectly suit your needs. You can easily come up with a wooden recycling center with tools that you could find in the hardware store. • Create Garbage Place: It might be a challenge for you to create a recycling system inside your house. In such a scenario, you should opt for a spot outside your home where you will be keeping your trash. 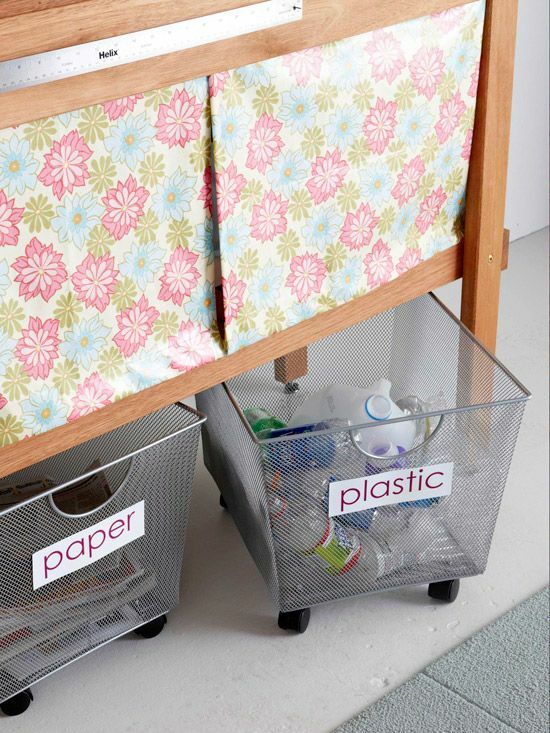 There can never be a shortage of things that you can recycle in your home. It can be a little tedious to come up with the best sorting and recycling system. However, with the numerous ways that are listed above, you can get into the habit of recycling your waste in no time. Choose a recycling program that is easy for your whole family to adopt. All in all, recycling is actually a small switch that you can make in your lifestyle. Actually, it can be really fun to recycle your waste bearing in mind that you are contributing to an eco-friendly environment. This article was guest written by our friends at The Good Stuff. The Good Stuff is here to keep you educated, empowered and entertained. And here’s our promise: We will give you the tools to improve your lifestyle, keep more money in your pocket, and leave you with a warm feeling all over. Simply put, we bring more good stuff into your life.